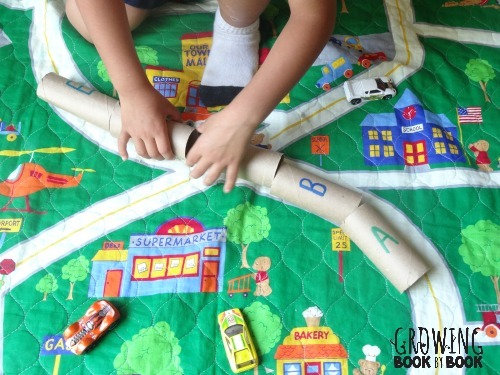 I’m so excited to have Jodie from Growing Book by Book here today, sharing a fun ABC activity you can play with cars and trains. Jodie has lots of great reading games, and I’m so happy she’s sharing one with us! Hello The Pleasantest Thing readers. My name is Jodie from Growing Book by Book and I’m excited to be guest posting today! My kids spend a huge chunk of their day playing with cars and trucks- inside on the floor, outside in the sandbox, on a cookie sheet in the car. So, I’m always looking for creative ideas to tie in reading activities to these experiences. 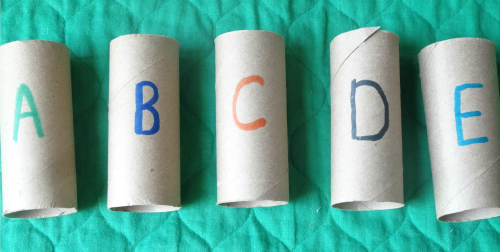 As I stared at a pile of toliet paper rolls we had collected, I came up with this easy way to practice alphabet recognition while enjoying car play. 1. Paint each toliet paper roll and allow to dry. You could leave them their natural brown color too. That is what we did! 2. Write a letter of the alphabet on the top of each roll. You could also write sight words or car related vocabulary words for older children. Your tunnels are now ready for playing. Load them up in a dump truck and deliver them to the new construction site. Let’s start learning! Lay all the tunnels out. Call out a letter and have the child drive a car through that tunnel. Variation 1: Call out a letter sound and have the child drive a car through the tunnel that represents the sound you said. Variation 2: Have the child order the tunnels in ABC order. They can then drive the cars through the tunnels in the correct order. 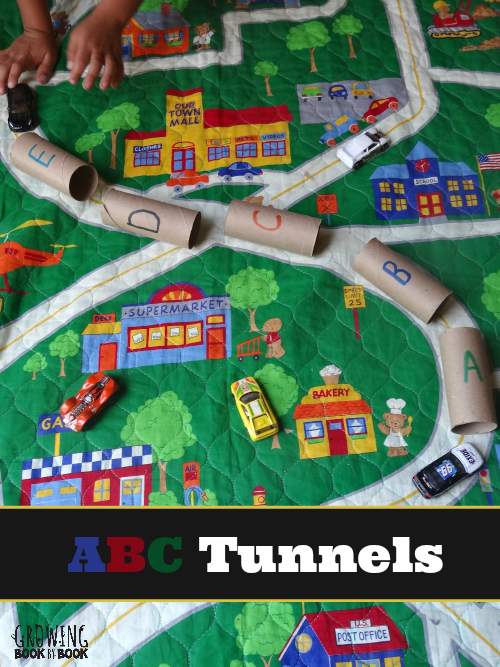 Variation 3: If using sight words, the child has to read the word on each tunnel as they drive through it. Variation 4: If using vocabulary words, the child has to use the word in a sentence that shows their understanding of the word. I would love to connect with you on my blog, Growing Book by Book. I’m also very active on Facebook and Pinterest. Jodie is a mom of two young boys ( 2 and 3.5). She is a former early childhood and elementary teacher and administrator. She has a passion for chocolate, cooking and nurturing our youngest readers.